India has always been under the scanner for poor child health issues. In 2015, around 1,34,000 cases of death due to measles have been recorded globally, of which 47,000 have been recorded in India. However, we have come a long way in our efforts to eradicate health hazards for children through vaccination. After the widespread success of polio and tetanus vaccination drives in the country, India is all geared up for the rubella and measles vaccination campaign on a large scale across the nation. Since 2000, around 17.1 million deaths have been averted worldwide with the measles vaccine. Like other countries, now India is also on a mission to eliminate measles and curb cases of Congenital Rubella Syndrome (CRS), caused by the rubella virus, considerably, by 2020. Rubella and Measles are highly contagious diseases, which mainly affects children. If not vaccinated at the right time, this can have life-threatening consequences including mortality. Measles is a childhood killer disease, and can cause serious respiratory and lung problems later. CRS on the other hand, can cause permanent and irreversible birth defects. It is very important to get children vaccinated against both of these because they transmit very quickly, especially among a crowded population. Moreover, rubella affecting a woman during pregnancy can also lead to still births. The measles vaccine was already a part of a child’s immunization process, where two doses were administered at 9-12 months and 16-24 months respectively. Now, the rubella vaccine has been introduced in the programme along with the measles vaccine dosages. Since, it be given along with an existing vaccine, the cost will also reduce. As per the current plans, the vaccination drive, which started February 5, 2017 plans to reach out to around 41 crore children in the age group of 9 months to 15 years to get them vaccinated with a single dose of combined measles and rubella vaccines. The Union Ministry of Health and Welfare launched this campaign along with states, NGOs and development partners such as WHO, UNICEF, Gates Foundation, Lions Club, IPA, IMA, and others. As mentioned above, both measles and rubella can be life endangering, if proper protection aka vaccination is not taken at the right time. The number, mentioned above speaks a volume about why is so important to get children vaccinated. Since, the introduction of the second dosage of measles vaccines and increasing the reach and awareness among people, the number of deaths due to measles reduced to 47,000 in 2015 from 1,00,000 in 2010. That is a huge success, and the Indian Government wants to extend the campaign further to achieve better results. Rubella, on the other hand is a mild viral infection, mostly affecting children, but many a times it goes unnoticed. The consequences can range from hearing impairment to heart problems, brain damage and even early death. It is alarming that 1,10,000 children born with CRS every year, worldwide, there are around 40,000 cases, which occur alone in India. It is also an important facts that pregnant women, affected with rubella virus can transmit the same to the baby in the womb, which can lead to abortion and foetal deaths. Hence, it is very important for the health ministry and related organization to join hands in an effort to educate the population and encourage them to actively participate in these campaigns. According to the World Health Organization (WHO), ‘single dose of rubella vaccine can give more than 95% long lasting immunity.’ So, we can imagine, how effective it is to handle such a contagious virus and that too for a booming population like in India. Hence, it is very important for us to understand the implications and administer the vaccines at the right time. To achieve the goal of measles elimination and CRS control by 2020, the vaccination campaign is targeting around 410 million children in 18 states, which requires around 465 million doses of vaccine. Since, there is only pharmaceutical firm in the country, which makes this vaccine, the campaign has been planned in 4 phases. Phase 1 has started in Karnataka, Tamil Nadu, Puducherry, Goa and Lakshwadeep. After the campaign, two doses of combination vaccine will be permanently included in the national immunization programme. Officials are reaching out to parents, schools, community leaders, caretakers, health workers and others to actively take part in the campaign. A campaign on such a large scale will definitely help us to achieve the set target, and take the country one step further in its commitment to improve health and well-being among its population, especially in children. 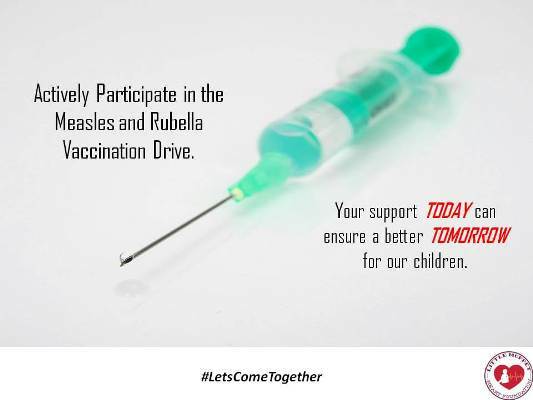 So, if you have children, who are yet to get vaccinated, or you know someone, who comes under the purview of this campaign or you run an Organization pertaining to children, please ensure to spread the word and actively contribute to the success of this drive by increasing awareness.